Many name ideas can be taken from the Corgi’s fox-like appearance. Fox-themed names taken from popular media include Tails (Sonic the Hedgehog’s sidekick), Tod (from Disney’s The Fox and the Hound), and Swiper (from Dora the Explorer). 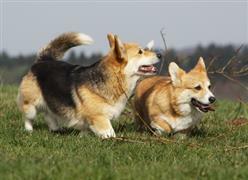 As if the appearance weren’t enough, Corgi’s (originally a herding breed) are also very quick and nimble. A few fitting names like Flash and Lightning can be derived from this trait. And you can’t think of quick and nimble names without considering Jack, the primary example, who spends his days climbing beanstalks and jumping over candlesticks. Both the Cardigan and Pembroke breeds of the Welsh Corgi originated from counties in Wales. Welsh names that match the personality or appearance of a puppy provide many unique options that are true to the breed’s roots. Some of our pages will contain a subcategory. A subcategory is a slightly more specific grouping than the main topic of the page. For a subcategory, we will include a separated table of names and corresponding descriptions. An example of a subcategory of Red Dog Names would be 'Dog Names Inspired by Red Wines'. If you have any subcategory ideas for the Corgi Names page, we would love to hear them. Use the form below to submit your ideas.